[From IMDB:] A university professor and a team of students conduct an experiment on a young woman, uncovering terrifyingly dark, unexpected forces in the process. 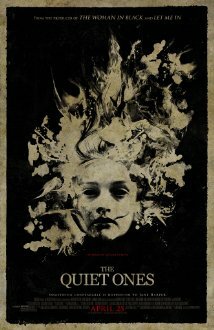 I went into The Quiet Ones not knowing anything about it, but it quickly seemed to be shaping into something intriguing. Scientific research into psychic abilities/possible demonic possession story? I’m there! Unfortunately, The Quiet Ones ended up being such a slow-burner of a film that it became tedious well before there was any kind of pay-off; and, said pay-off was hardly worth the wait. The core concept of the movie is actually a pretty interesting one, especially given that it’s (very) vaguely related to a real event (Warning: link contains spoilers). Thus, the failure of this movie to be truly engaging wasn’t the result of a lack of material to work with. Nor was it the result of bad acting. All of the cast did an admirable job. Olivia Cooke can put on a tortured look like no one’s business; and while Jared Harris comes across as a creep to me in all of his roles, it worked especially well here. The problem with The Quiet Ones ultimately comes down to its horrible pacing, and a plot that simultaneously tried to do too much, and too little. That might sound like it’s too much of a contradiction – and normally I might even agree – but, somehow, this movie managed it, by delivering its most important information, and its most noteworthy scenes, as a spattering amidst an onslaught of what I suspect was meant to be character/story development, but which ultimately ended up being nothing more than mediocre story-telling. To say that I ended up being disappointed by The Quiet Ones would be an understatement.